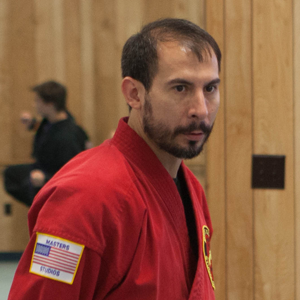 Sensei Billy Ilderton began his martial arts training in 1984 and became a certified martial arts instructor at the age of fourteen. He is currently a 4th degree black belt of Shaolin Kempo Karate. He also has a 1st degree black belt in Tae Kwon Do, a 1st degree black belt in Tang Soo Do with the World Tang Soo Do Association, and a black sash in Wu Shu. He has fifteen years of training in Tai Chi and is a certified cardio kickboxing instructor.